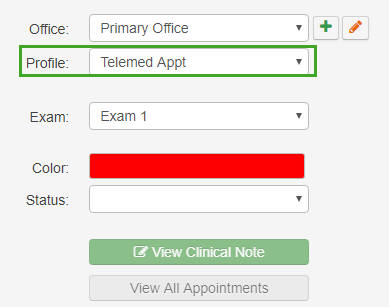 Now that you've created your telemedicine appointment profile, it's time to schedule a telemedicine appointment in drchrono! Hover over "Schedule" at the top and click "Dashboard". Under the Appointments widget, select "Schedule a new Appointment". Enter the appointment details. No matter the date, time, patient, or provider, you must select the appropriate telemedicine appointment profile. Note: Patients must have a unique email attached to their patient record! Scheduling an appointment for a patient without an email address will not work. Tip: You can have the date and time automatically populated by scheduling in the "Calendar" view and double-clicking on the time you wish to schedule. Patients will now receive an email and text message letting them know of the date, time, and provider.